The 2016 GMC Yukon XL adds features and functionality, but still manages to lag behind its competition. With options quickly disappearing in the near-luxury large SUV segment, the GMC Yukon XL seems to deliver with a duo of powerful engines, a wealth of seating and storage, and 8,000 pounds of towing capacity. But manufacturing oversights and some competent competition mean you should strongly consider alternatives before making your decision. Before you discount the Yukon entirely, take a look at improvements that have been added to the 2016: a faster processor for its IntelliLink system, Apple CarPlay, and added safety features like lane-keep assist and auto high beams, plus SLT trims and above are now fitted with a hands-free power rear liftgate. With true trucks rapidly fading into 20th-century obscurity in favor of car-like crossovers, the capability of a body-on-frame truck is an increasingly scarce commodity, especially in this XL trim with its longer wheelbase and more spacious third row. Other than the Yukon XL, you’re looking at options like the Ford Expedition EL and the Toyota Sequoia, both great entrants in this segment. With the Yukon XL, you’d better be ready for nearly 19 feet of truck, standing at over 6 feet tall. It’s a lot of vehicle, and enough that driving in any city is going to take special attention. Luckily the Yukon is fitted with an embarrassment of sensors to warn you long before you accidentally nudge something into oblivion. The reward for all that bulk is the capability to seat 9, haul 121 cubic feet of cargo, and tow up to 8,300 pounds. Utility like that simply has to come with some drawbacks, and the Yukon does its best to make them as palatable as possible. Starting at the base SLE trim, you’ll pay around $52,000 and get that impressive 9-person capacity, front and rear parking sensors, auto headlights and wipers, a rear-view camera, remote ignition, and keyless entry. Foglights, running boards, and roof rails are standards here, along with comfort and convenience features like tri-zone auto climate control, rear privacy glass, power front seats, and cruise control. 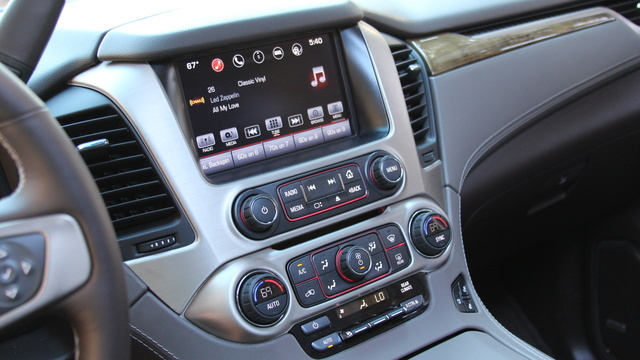 The 8-inch touchscreen comes loaded with the upgraded IntelliLink system and offers Bluetooth, a 9-speaker Bose stereo, HD and satellite radio, a whopping 5 USB ports and an Aux input, plus 4G LTE with a Wi-Fi hotspot. Added luxury is available via the Convenience package, adding a power liftgate, auto-dimming rear-view mirror, and power-adjustable pedals. And every Yukon comes with a locking rear differential, 2-inch towing receiver, and 7-pin harness. For extra safety, an Enhanced Driver Alert package will upgrade your auto headlights with automatic high beams, plus tack on a forward-collision warning system, lane-departure warning and lane-keep assist, and a vibrating seat to let you know when these systems have been triggered. The $60,000 SLT trim doubles down on the safety with the Enhanced Driver Alert package included, which adds rear cross-traffic alert and a blind-spot monitoring system, but it’s the comfort and convenience that really gets the business here. Besides the Convenience package being included, you’ll also get keyless ignition and entry, a hands-free power liftgate, heated and ventilated front seats with a heated power second row and power-folding third row, power-folding mirrors with auto-dim, a heated power tilt-and-telescoping steering wheel, driver memory, and wireless charging. The SLT also adds ambient interior lighting for an extra splash of opulence. With the SLE and SLT trims, you can add an HD Trailering package that ups the ante on the towing capability with lower gearing, an air suspension, and a trailer brake controller. If you want to customize your Yukon, you can add second-row captain’s chairs or splurge on the Open Road package for a sunroof, navigation, and a rear entertainment system with a Blu-ray screen. Curiously, you can also add adaptive cruise with crash-avoidance braking, a feature that should’ve been included in the EDA package. 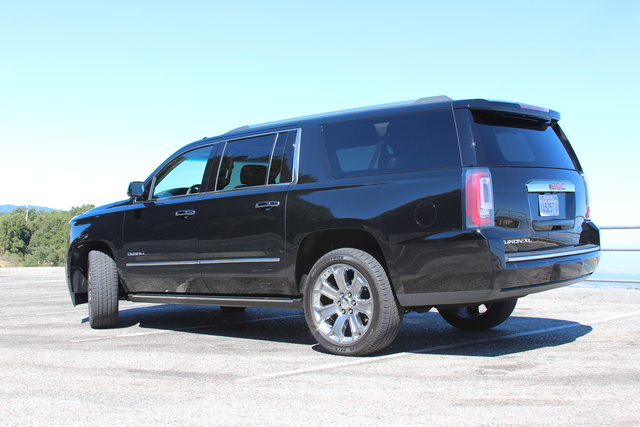 For my week with the Yukon XL, I was given a top-tier Denali trim, which starts at just over $71,000. This adds visual upgrades like a unique chrome grille, 20-inch alloys, xenon headlights, and a customizable digital instrument panel. 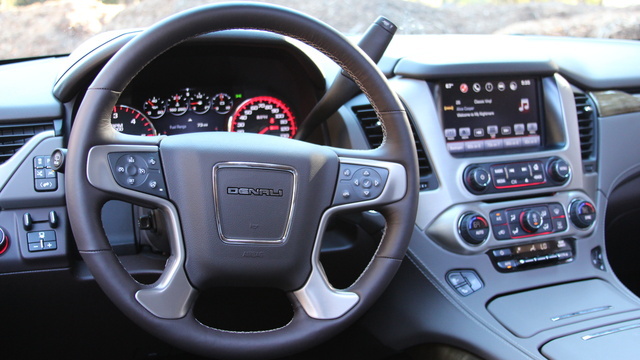 From a more functional perspective, the Denali adds a larger V8 engine, a magneto-rheological suspension, standard trailer-brake controller, navigation, and second-row captain’s chairs. The Denali also features an upgraded 10-speaker Bose Surround Sound stereo and active noise cancellation that make it one of the quietest vehicles I’ve tested on the highway. Still not enough? You can push the price of the Denali past $80,000 with unique 22-inch alloys wheels with chrome inserts ($2,495), the Open Road package ($2,860), a heads-up display ($425), power-retractable running boards ($1,745), adaptive cruise ($995), and a theft-deterrent system ($410). With a $1,195 destination charge and a current $500 discount on the Open Road package, the total price for the Yukon XL Denali I tested came to $80,650. SLE and SLT Yukons are powered by a very capable 5.3-liter V8 engine pushing 355 hp and 383 lb-ft of torque through a 6-speed automatic transmission. Choose rear-wheel drive (RWD) or 4-wheel drive (4WD) with a 2-speed transfer case and low-range gearing for serious towing capability, although the maximum here is achieved in RWD models at 8,300 pounds. The EPA estimates the 5.3-liter V8 at 16 mpg city/23 highway with RWD and 15/22 with 4WD, and a combined rating of 18 mpg for both. Sixty mph can be reached in a little over 7 seconds, which is impressive, but competitors do have it beat. The Denali’s 6.2-liter V8 pumps out an impressive 420 hp and 460 lb-ft of torque, yet can’t match the 5.3-liter for towing capacity, topping out at 8,100 pounds with RWD and 7,900 with 4WD. Thankfully, it brings the bacon in the speed and efficiency department. The 6.2 can make it to 60 mph in just 6.4 seconds, and while the EPA rates it at 14 mpg city and 20 highway for a combined rating of 16 with 4WD, I was able to best this easily throughout my week with the Denali, even beating the RWD’s 17 mpg combined (15/22) rating. This is not something I find often with the cars I test, and it was a very welcome surprise here, with my best average rating often getting well into the low 20s and my combined average going over 17 on some 50-mile test loops. 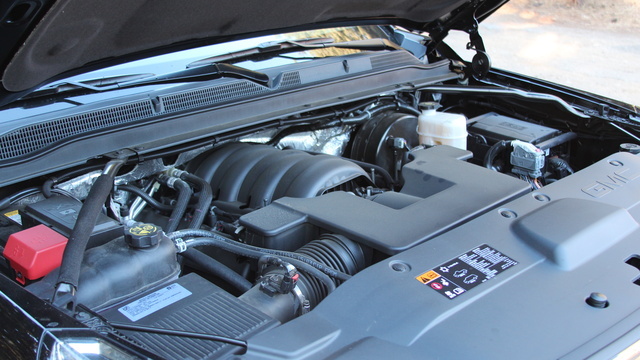 However, the cylinder deactivation that drops the engine down to a V4 at cruising speeds means that passing required waiting through a long delay before the extra cylinders kicked back in and pushed the Yukon along. That's a small frustration, but in a vehicle this large, the last thing you want is input delays. 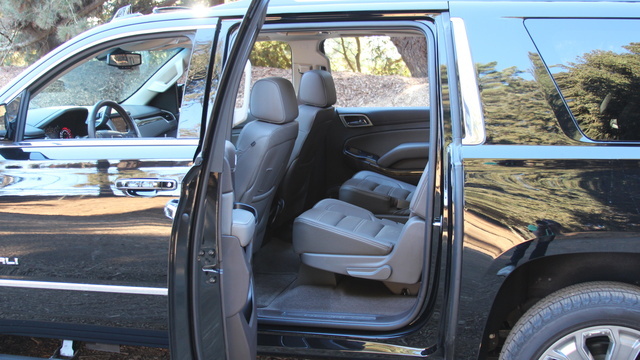 The extra-long Yukon XL is aptly named, suffering none of the cramped third-row woes of the regular-length Yukon, but with a low-mounted seat bottom, adults will find their knees high in the air. That third row is best left for children. At 19 feet long, the Yukon XL requires some special care when driving in even slightly cramped spaces, and thankfully it’s packed with sensors to tell you when you’re getting close to anything. However, some are optional, so make sure you get everything you’ll want. The Denali has power-retractable running boards to help you get in and out, although you'll have to be careful to avoid banging your shins when simply opening a door to retrieve a forgotten phone or wallet. They do retract again if they impact anything when deploying, but not before bruising. After a week, I’m left with some rather sore lower legs, though I’m sure that’s something I’d get used to avoiding. Second- and third-row entertainment systems will keep kiddos distracted, but the screens are a bit small compared to the larger units found in a Toyota Sienna for one example. The C pillar also intrudes on visibility for third-row occupants, so make sure anyone who is prone to carsickness is graced with a second-row spot. The magneto-rheological suspension seems to do a good job keeping things from getting too boaty and floaty, although I found some jitteriness at speed, even bordering on pogo-ing. This would undoubtedly be lessened when carrying a full load, however. I’ve seen speculation that this is due to stiffened body and frame mounts in the rear, implemented to further inhibit rollover, so it seems a good compromise. Still, the Sequoia and the Expedition both drive better on the road, so it’s a compromise you don’t have to make. The power-folding second- and third-row seats make things more than easy. The third row powers up as well, and second-row seats return with a one-hand touch, even when reaching across the row, meaning you can operate them with child, bag, or helmet in hand. But the deck height on the rear is higher than competitors, and that’s a hard advantage to ignore. One special caveat here: Large GM trucks built in 2015 have been affected by a particular manufacturing problem. Thin sheet metal used in the roof can become detached from the support bows, causing the roof to flex at speed and change cabin pressure. It’s bad enough to cause queasiness and general discomfort, so make sure you test-drive the truck you want before you buy it. GM is aware of the situation and has issued information and service bulletins on the issue, and it claims the problem was taken care of on the assembly line by the end of 2015. While this hasn't affected every large GM truck out there, any of them might be affected—that means the Tahoe, Suburban, and Escalade, and even the pickups, like the Silverado and Sierra. The Yukon XL gets every bit of technology available, if you’re willing to pay for it. The base SLE trim does come well-equipped, however, with front and rear parking sensors, auto headlights and wipers, a rear-view camera, remote ignition, and keyless entry. With the processor upgrade for the IntelliLink system, there are fewer gripes with regard to input delay, and the standard 8-inch touchscreen with 9-speaker Bose stereo is complemented by HD and satellite radio, 5 USB ports, an Aux input, and an SD slot, not to mention a Wi-Fi hotspot. From there it’s whatever you’re willing to pay for, but the prices can pile up quickly, and some features really feel like they should be included, especially at the higher trim levels. Paying $1,000 for adaptive cruise control, $425 for a heads-up display, and $2,300 for the Open Road package’s power sunroof, rear-seat entertainment, and 9 more months of satellite radio stings when you’re already paying more than 70 grand just to start at that level. Same with the $410 theft-deterrent system. Discounting that feature, the Denali I tested had already crested $80,000, and at that price, it seems like including the peace of mind that it won’t get stolen should be a given. In short, overall safety in the Yukon could be better. Despite its prodigious size and long list of safety features, the Yukon still managed only a 4-out-of-5-star rating overall from the National Highway Traffic Safety Administration. Frontal impacts received the same score, though side impacts were better at 5 out of 5, helped by a center airbag located between the front bucket seats. Braking is a similar story, with the Yukon XL taking 134 feet to come to a stop from 60 mph, a figure that’s bested by the Expedition EL (126 feet) and the Sequoia (125 feet). The lofty price of the Yukon XL must be taken into perspective, especially considering that the base price and the price for a fully outfitted Denali are separated by 30 grand. But competitors are similarly expensive, so it’s hard to hold it against the Yukon. That said, when the Expedition and the Sequoia both offer a better ride, more accessible cargo section, and none of the manufacturing mishaps of the Yukon, I’d strongly suggest checking them out before you buy. Reliability has been an issue with the Yukon as well, with it scoring below average in every category except feature quality and design. A long list of rebates and incentives expired on 9/30, so if you’re interested in the Yukon, wait and see if they’ll re-up those to try and woo customers back in, or skip the 2016 and go straight for a 2017 model, so you won’t risk the roof issue. What's your take on the 2016 GMC Yukon XL? 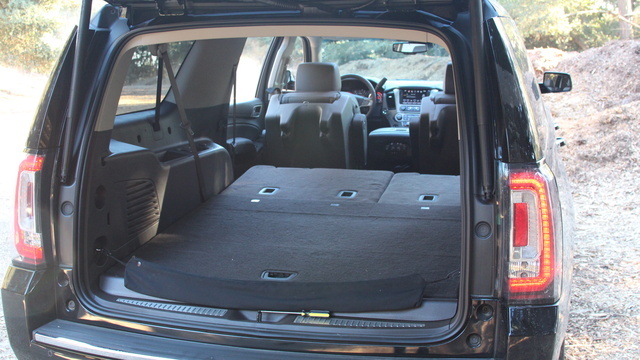 Keech The 2016 GMC Yukon XL Denali's gas tank is too small at 31 gallons and the height of the cargo space with the seats folded down is only 31 inches. My 2000 Suburban that I am trying to replace has a 41 gallon gas tank and the rear cargo space is 42 inches high! TheHorror Good enough for government. Users ranked 2016 GMC Yukon XL against other cars which they drove/owned. Each ranking was based on 9 categories. Here is the summary of top rankings. 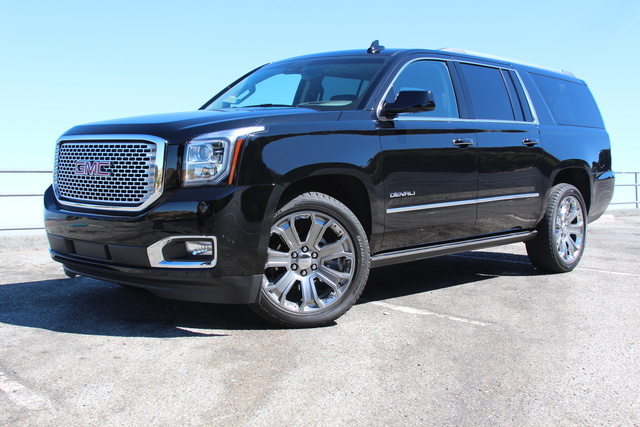 Have you driven a 2016 GMC Yukon XL? We just bought a 2016 Yukon XL. We want to switch out our bench seat to captain seats since we have twins babies. Any advice how?? car fax says damage reported to front of the car. dealer says that it has to be over 250.00 worth of damage for it to be listed at an accident. Is this a true statement?